Order your Cross Limited Edition 2017 Star Wars Fountain Pen today from FahrneysPens.com. Fine Pens, Refills & Luxurious Gifts – great prices & fast shipping. Cross proudly introduces three new characters to its Townsend Star Wars Limited Edition collection. 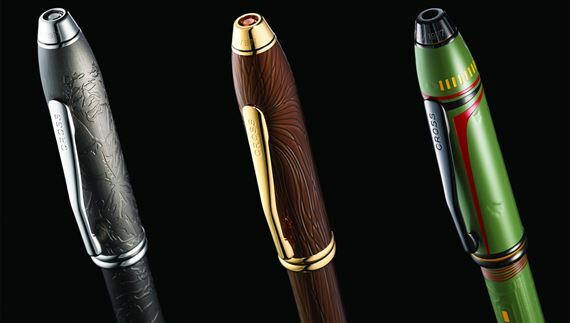 Each Townsend Star Wars writing instrument is crafted to reflect the spirit of its character. Every pen is created to reflects a passion for the simple, beautiful design language, and impeccable attention to detail that has made the brand legendary. This limited edition is no exception. Recognizable details are elegantly etched into the Townsend profile. A legendary Wookiee warrior and Han Solo’s co-pilot of the Millennium Falcon, Chewbacca was part of a core group of Rebels who restored freedom to the galaxy. The two-hundred year old Wookiee is known for his short temper and accuracy with a bowcaster. Yet his big heart is revealed through his fierce and unwavering loyalty to his friends. Chewie has stuck by Han through years of turmoil that have changed both the galaxy and their lives. 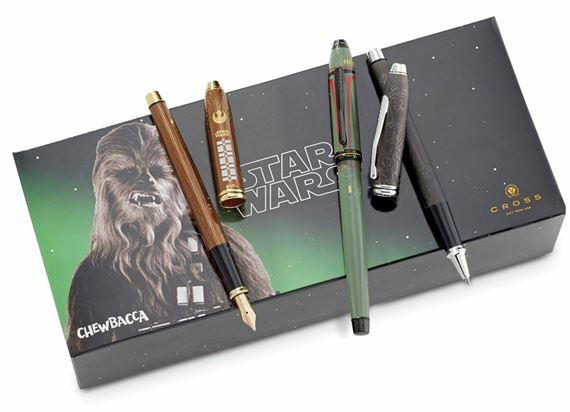 This pen features a Chewbacca themed design and an embedded Smoked Topaz Swarovski® crystal. Smuggler. Scoundrel. Hero. Han Solo, captain of the Millennium Falcon, is an undeniable force in the Rebel Alliance. 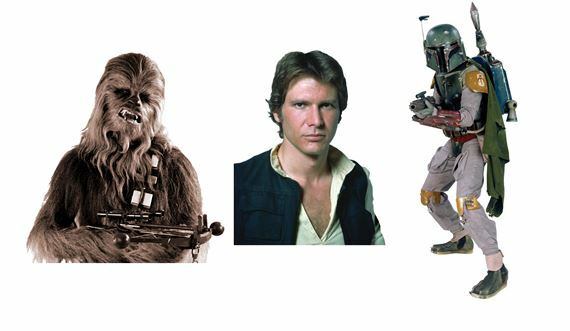 He and Chewbacca come to believe in the cause of galactic freedom and join Luke Skywalker and Princess Leia in the rebellion that would ultimately defeat the Empire in the Galactic Civil War. This pen features a finish inspired by Solo’s captivity in carbonite and topped with an embedded genuine Swarovski® jet hematite. With his customized Mandalorian armor, deadly weaponry, and silent demeanor, Boba Fett is a bounty hunter with allegiance only to himself. He takes contracts from the Empire and the criminal underworld, including one that leads to the delivery of a carbonite-encased Han Solo to Jabba the Hutt. A genetic clone of his father, bounty hunter Jango Fett, Boba learned combat and martial skills from a young age. Shrouded in mystery and unmatched skill, he is one of the most feared bounty hunters in the galaxy. 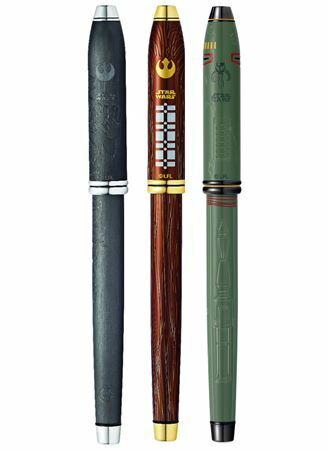 This pen features a striking Boba Fett themed design and cap emblem. 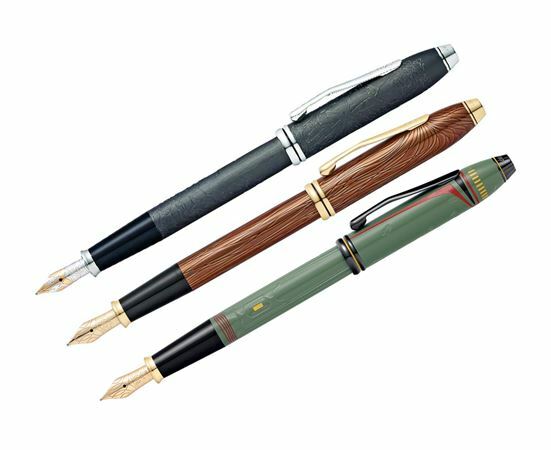 Choose from the outstanding Townsend fountain pen with 18K gold nib or the versatile Selectip capped rollerball. 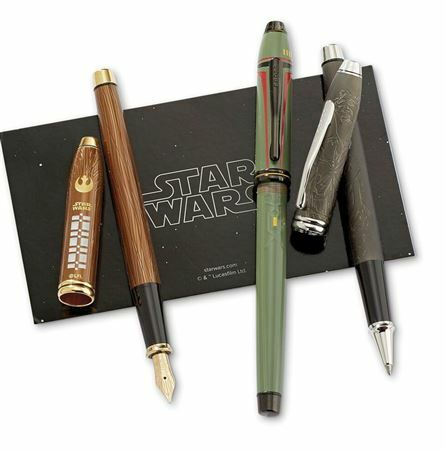 Limited to 1,977 numbered pens per mode – the release year of the original Star Wars: Episode IV film – each pen comes in a character-specific collector’s box with a Star Wars black acrylic pen stand and a certificate of authenticity signed by the Cross designer.